Insanity Asylum is the newest extreme workout from Shaun T. This 30-day workout focuses on building speed, coordination, balance, agility, and power. According to the schedule, before you officially start Asylum, you should take the Athletic Performance Assessment, a 25-minute series of drills to help you track your fitness progress. I confess, I skipped it in favor of going straight to Speed and Agility, the first real workout in the series. To say that Asylum Speed and Agility is an intense cardio workout is a serious understatement. At 45 minutes, it’s designed to make you faster, more fluid, and more agile. Equipment used is the Agility Ladder (no, you won’t be climbing it) and the Speed Rope. You can also do the Speed Rope moves without the rope and someone on the DVD shows you how. Nope, I didn’t use it. The warm up series is designed to give you the foundation you need to gain control and master your form. Ten minutes may not sound like much but I was breathless from this Shaun T. warm up and my legs were burning. Moves include Speed Rope High Knees and Squat Jump ropes. These alone exhausted my legs. Other unique moves include Agility Heisman with Tap where you fast Heisman through the Agility Ladder rungs and then sprint back to the other side and start over. You’ll love the toe taps where you move through the ladder in plank position! After a quick and well-deserved stretch, the real workout starts! If you thought Insanity was hard, you have not experienced Asylum yet! First up is Mountain Climber Progressions, where you start in plank position over the ladder. You quickly switch your feet in and out of the first ladder rung. After 30 seconds, you switch your feet in and out of the next ladder rung and so on. It only gets harder. Shaun encourages you to power through each progression. Moving Push Ups with In and Out Abs through the ladder rungs, Stationary Criss Crosses, and Bear Crawl with V Push Ups are just a few of the exercises you’ll power through. You just need to experience Insanity Asylum for yourself. I was a pile of sweat and totally breathless by the time I finished. Legs were on fire and I continued sweating for 20 minutes after I finished. 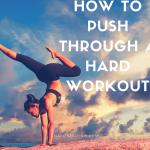 Yes, this was one of the hardest workouts I ever tried. It’s more than just a physical challenge. You’ll need to bring your total mental focus to this Asylum workout. It’s so worth it. Order Insanity Asylum with Shaun T.